This story first ran last year in The Notebook. As I note elsewhere in this edition, there are 50 craft brewers now operating in Nova Scotia — with a good chunk of them in rural Nova Scotia. Brian Titus is debuting a summertime beer this season, called Wicked Good Pale. He founded craft brewer Garrison 21-years ago. Craft beer or micro-brewed beer typically involves a brew plant in the 10,000 hectolitre capacity — much smaller than firms such as Oland Brewery, owned by a global giant in Belgium, that has capacity for one million hectolitres, as does Moosehead Brewery in Saint John. In the last 20 years, beer consumption has decreased, with the only growth segment coming from craft brewers. When you consider the market share for craft beer manufacturers such as Halifax’s Garrison & Propeller was at about three per cent just five years ago, but has now grown to an eight per cent market share, it gives you a glimpse of how popular craft suds are for the beer drinking segment of society. 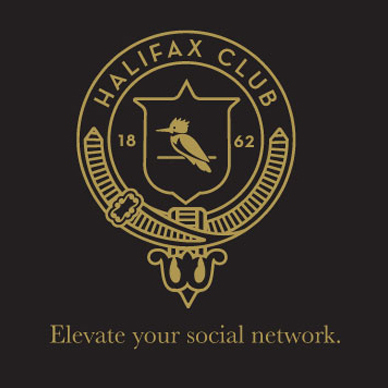 In this story, I examine a just completed market study for the year 2016, commissioned by the Craft Brewers of Nova Scotia, and funded by an ACOA grant of close to $30,000. The data rich economic impact study was written by Productivity Solutions Corporate Consulting Inc and Martha Reynolds Marketing. 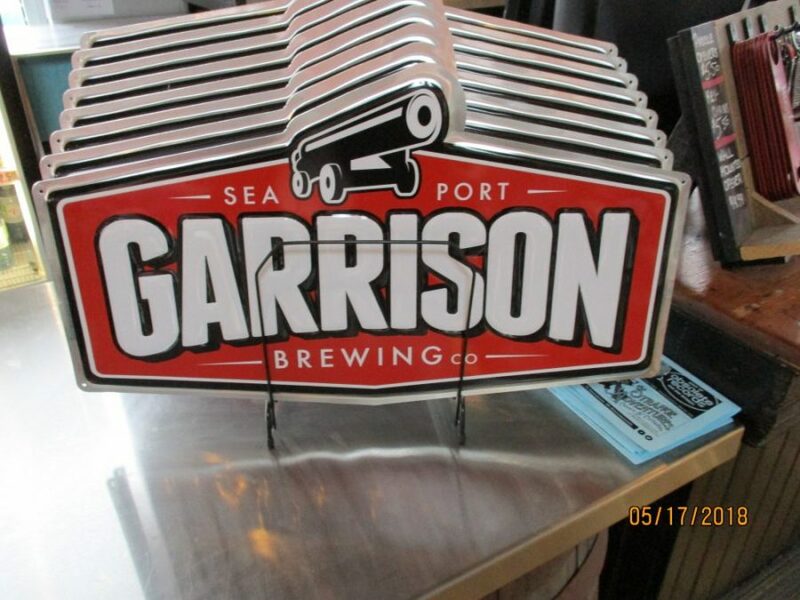 Garrison Brewery is 21-years old, founded in 1997. The study found that just in 2011 alone, Nova Scotia craft brewery operations had a tiny 1.8 per cent market share – which today has robustly grown to eight per cent. The report, given to The Macdonald Notebook, by the craft beer association, suggests the market share could grow in this province to 13 per cent by 2026. “Per capita, beer consumption over the last 26 years has declined in all provinces and territories. This is a reversal of the 17-year (growth) pattern from 1988 to 2004,” says the beer study. Imported beer consumption in Canada has grown, but at the expense of large Canadian breweries, pinching folk like Oland and Moosehead. Despite an increase of beer drinkers reaching the age of majority since 1993, beer consumption declined below 1993 levels, only reaching a peak in 2009. 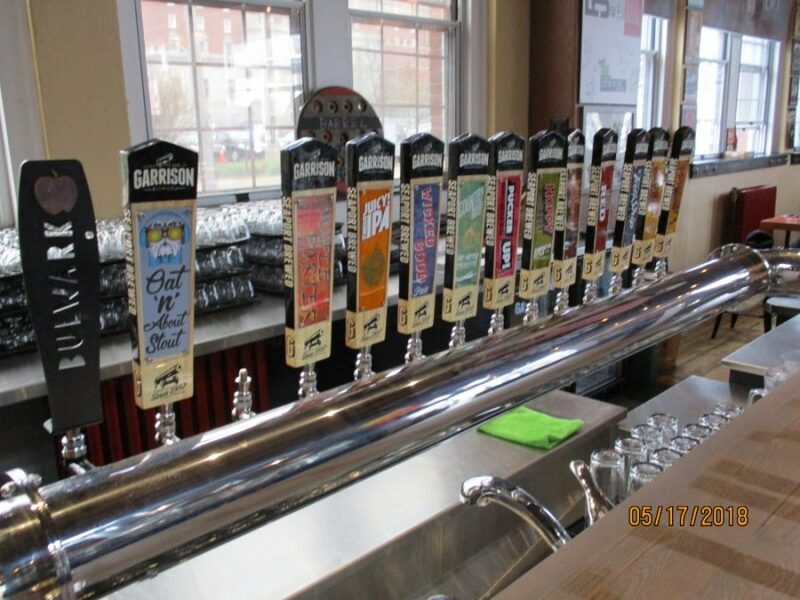 The taps at Garrison Brewery at the Halifax Seaport. “Only Nova Scotia craft beer, craft beer elsewhere in Canada and imported beer had growth in sales volume,” found the brew report. A popular imported beer in Nova Scotia would be Mexican-made Corona. Looking at beer habits, 41 per cent of Nova Scotians over the age of majority do not buy beer at all. While traditionally, beer is king at the Nova Scotia Liquor Corp., the penetration of wine in this province was higher than beer, standing at 63 per cent, while beer penetration came in second at 60 per cent. Thirty-eight percent of the drinking population buys beer at least once a month versus 20 per cent who buy Nova Scotia craft beer products. Those who like craft beer like it a lot — with 53 per cent of craft beer purchases buying ‘frequently’ versus 64 per cent for regular beer consumers. The study found that 80 per cent of craft beer sales occurs at the NSLC, 70 per cent at restaurants, and 51 per cent buy at a craft beer store, while 22 per cent buy the product at the private wine stores, and 10 per cent buy from Farmer’s Markets. Consumer preference for craft beer is strong, with 83 per cent of Nova Scotians saying the provincial products offer the same value as craft beer made elsewhere in the country. “Fifty-six percent say Nova Scotia craft beer is superior to other craft beers,” says the study. “There is room to increase market penetration of Nova Scotia craft beer as it currently is about two-thirds of the penetration rate that beer overall does,” says the impact study. “Beer consumers start out by purchasing commercial beer produced in Canada. Their tastes evolve and they allocate more purchases to craft beer and imported beer because craft beer is an acquired taste, not something you enjoy right away,” says the study. “Craft beer is perceived to be ‘small batch’ beer, unique to each brewery, enjoyed for its distinctive taste/flavour. Craft beer is consumed when you’re ‘drinking for taste’ or drinking with food, not necessary to ‘get a buzz on’,” found the report. It reports that young drinkers, under 40 will buy craft beer to ‘change things up’, while folk over 40 buy craft beer as a treat. The study suggests the Nova Scotia craft beer industry create a culture similar to the province’s wines, noting the successful Tidal Bay wine appellation, with a distinctive regional feel. The ‘buy local’ movement has benefitted the Nova Scotia craft beer industry, notes the report. A weakness in the industry, reports the study, is that there are no craft beer standards or quality guidelines in place, and it, therefore, suggests anyone can label a beer as craft beer. “A lack of clarity and awareness of the Nova Scotia craft beer brand’s promise beyond its ‘local-ness’ leaves the industry vulnerable to encroachment by other craft beer manufacturers outside the province. 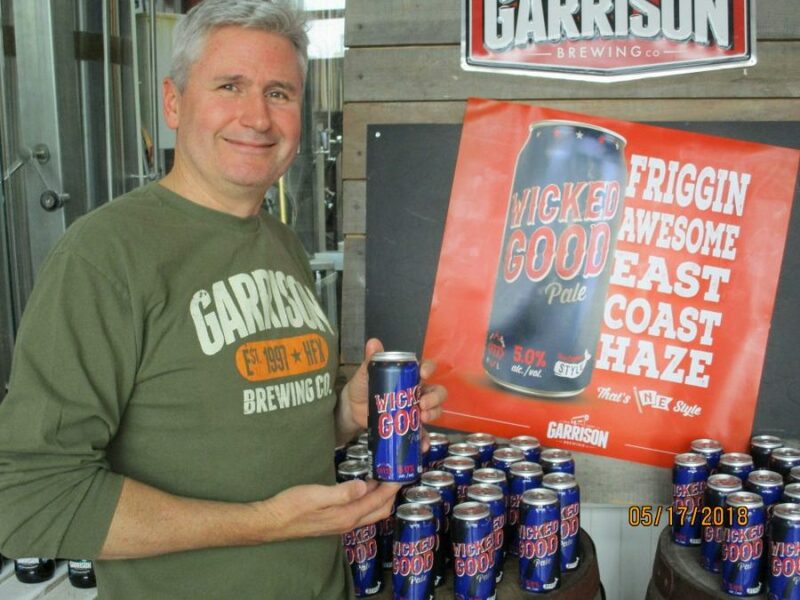 Garrison Brewery was founded in 1997, as a craft brewer in Halifax, and now does $5-million in annual sales. 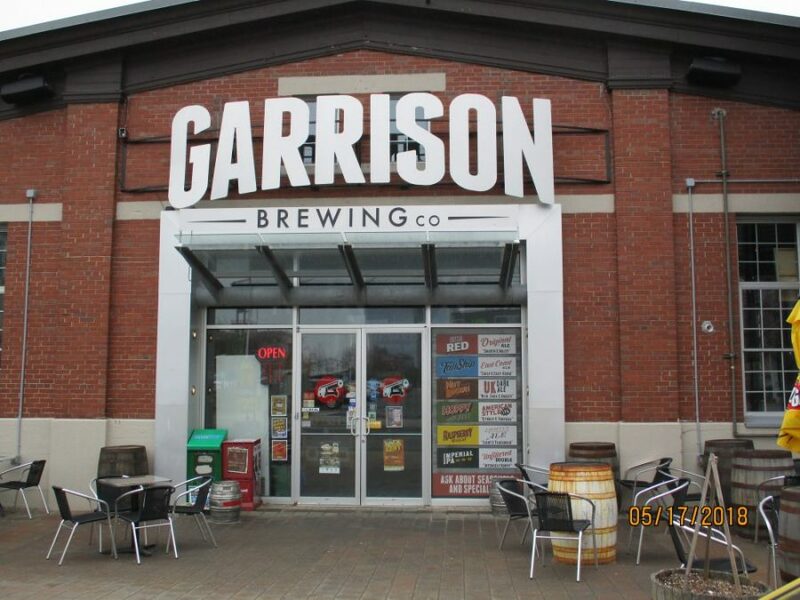 It also says another weakness is small profit margins for startup brewers, limiting profits for re-investment, unless they are of a bigger scale like Garrison, which now has $5 million in annual sales. “Industry’s structure is still in development. A sizeable portion of industry players and producers or brewpubs risk going out of business if they cannot grow their total volume, and or business,” says the report. Nova Scotia has the oldest population of any province in Canada, and this poses a demographic challenge to beer makers. “The core beer drinking age — 19 to 24 years — continues to decline,” and that limits brewers from developing a following at an early age. It also found craft beer purchases might buy a can or a bottle of this or that, while commercial beer plants sell six and 12-pack and 2-4s. It says the NSLC monopoly poses “a type of conflict of interest,” as the NSLC is both an industry promoter by having a mandatory board seat on the Craft Brewers Association of Nova Scotia, and serving as a monopoly regulator which imposes tariffs and taxes and mark-ups, and acts as the largest customer for beer plants. The beer association says NSLC’s only involvement with the craft beer industry is as a customer and regulator, so it avoids the “awkward position” in a type of conflict of interest. The study suggests the Craft Brewery Association of Nova Scotia could create a premium category so craft beer can compete with premium import beers. The study found a ‘threat’ for the Nova Scotia craft brew industry can come from larger craft beer makers such as Goose Island, Mill Street, located elsewhere in Canada, and from Boston’s Samuel Adams due to their size and ability to advertise and market. The craft beer industry globally and just in the US alone is expected to grow by 20 per cent annually, and as such, the demand for grains such as barley, wheat, yeast, and hops will increase substantially as well. Small brewers may be faced with less bargaining power as a result, says the study. It says there are more brew operations to open in the future, but smaller beer companies might actually fold. The study found that some craft beer makers in Nova Scotia forecast growth of 12 per cent to 15 per cent yearly over the next five years. In 2016, the market share for craft beer in New Brunswick was three per cent, six per cent in Ontario and 11 per cent in BC and the US. As I previously mentioned, the Nova Scotia market share is now eight per cent, and stood at five per cent during the study year of 2016. Craft brewers in Nova Scotia in total had sales of $17.87 million in 2016, says the report, and directly employed 330 people. “Cash flow can be an issue for many brewers. Therefore, there should be a lobby effort to decouple the NSLC markup, and establish tiered wholesale rates and lobby to establish retail sales markup rates,” says the report. It suggests the NSLC deploy favourable markups so that the industry can re-direct profits back into beer plants. “The decision by the NSLC to effectively lower the retail sales markup rate by charging five per cent of the agreed wholesale value has improved the ability to invest back in businesses,” says the report, but it had a caution for brewers. The study says there could be growth for the province’s craft brewers on the export market, especially as double digit sales are being forecasted for Asia, the Middle East, and Africa.